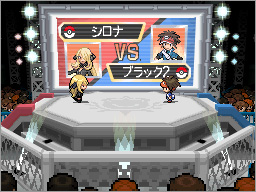 The Pokémon World Tournament is a new feature introduced within Pokémon Black 2 and White 2. It allows for important characters like Gymleaders, Elite Four and Champions from different regions to come and participate in the tournament unlike before! You now have a chance to face characters like Brock, Misty and Red with your exciting new 5th gen Pokémon team! The Pokémon World Tournament is located south of Driftveil City where you'll see a huge facility which is where all the battles will take place in. 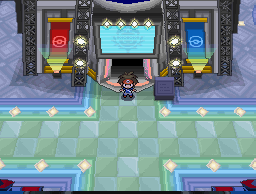 The tournaments organizer is Champion Cynthia from the Sinnoh Region as she will take you through the tournament. The tournament accepts Single Battles, Double Battles, Triple Battles and Rotational Battles. You will only be able to access up to one facility depending on how far you have gotten in the story-line, with more being available as you progress. Standard Tournaments can be accessed by going through the left staircase and they feature a wide variety of trainers and challenges for you to earn Battle Points. Rental Tournament: This tournament chooses random Pokémon for you. Mix Tournament: All Level 50 Pokémon, you have the ability to switch Pokémon with your opponent before battle. Rental Master: Same as the previous rental tournament, it chooses random Pokémon for you however, they are more stronger and rarer. Type Master: Battle with a single type, also has stronger and rarer Pokémon than previous tournament types. In addition to that, you also have the option to download teams over the Nintendo Wi-Fi Connection. Tougher opponents will be available to download as you progress. The Advanced Tournaments are where things get more challenging. You face tougher opponents with stronger Pokémon than you did in the Standard Tournaments. Opponents are unlocked as you beat them. The battle types feature Single, Double, Triple and Rotational Battles. 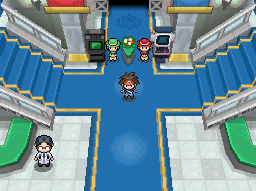 Once you've defeated the Unova Leaders, you'll unlock the other four regions; Kanto, Johto, Hoenn and Sinnoh. After beating all the region leaders, you'll unlock World Leaders which features you battling all the Gym Leaders from all regions. After beating the World Leaders tournament a solid 10 times, you'll unlock the Champions Tournament which features you battling all the Champions! Below we have compiled a list of all the leaders you will face in the Pokémon World Tournament. With details on all of their Pokémon which consists of Attacks, Abilities and Hold Items, it allows you to strategize and make the tournaments much easier for you to beat!